Mods: I made the leg of the sock about 5 inches, because I only had two skeins of this (from a swap) and they needed to be huge man socks. I also used a square toe instead of the one shown in the pattern, because I like it better. I gave these to their recipient last night, and of course forgot to take a picture of the completed socks before I gave them away. 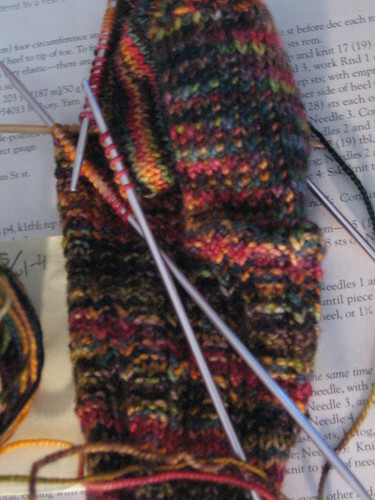 So, you get a picture of a half finished sock. As always, I enjoyed working with Koigu, and I really am sold on their bright colorways. Now that I have all/most of my projects done, I decided to start on a pair of socks for me with some Shibui yarn in Empire Blue, and finish the benis I’m working on. It’s going very quickly, and I suspect I’ll be starting on benis 2 (in bright red!) soon. Pictures forthcoming. Random Factors: buy a “Cthulhu Loves Yarn” shirt!